Tonight went see Pirate of caribbean Deadman tell no tales starting Johnny Depp Javier Bardem Kaya Scodelario Geoffrey Rush​ Brenton Thwaites Orlando Bloom director bye Joachim Ronning , Espen Sandberg and producer Jerry Bruckheimer . Thrust into an all- adventure, a down-on-his-luck Capt. Jack Sparrow feels the winds of ill-fortune blowing even more strongly when deadly ghost sailors led by his old nemesis, the evil Capt. Salazar, escape from the Devil’s Triangle. Jack’s only hope of survival lies in seeking out the legendary Trident of Poseidon, but to find it, he must forge an uneasy alliance with a brilliant and beautiful astronomer and a headstrong young man in the British navy . This movie better movie last two Pirate Caribbean movies this better storytelling of movie the villan was awesome. Javier Bardem who in movie evils Captain Salavar was great villan in movie since Davy Jones . Javier Bardem performance great playing the role of character like was in movie . Johnny Depp reprised role ask Jack Sparrow he be character agim is funny ask usel been Jack Sparrow he good ask all way in the movie . Now mentioned this case considering other sequel of franshines Jerry Bruckheim said well other one if Johnny Depp if he sign other movie . Not be a other sequel movie franshines this great movie ends Pirate Caribbean movies franshines really enjoyed this movie franshines. 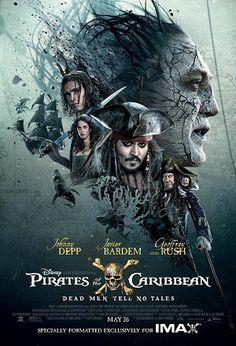 This movie review Pirate Caribbean Deadman​ tell no tales starting Johnny Depp and Javier Bardem Kaya Scodelario Geoffrey Rush and Brendon Thwaites Orlando Bloom director bye Joachim Ronning and Espen Sandberg and producer Jerry Bruckheim.